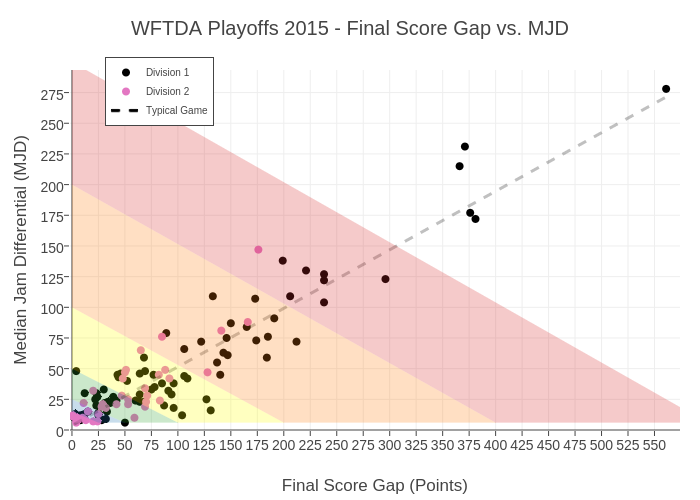 Windyman's interactive graph and data of "WFTDA Playoffs 2015 - Final Score Gap vs. MJD" is a scatter chart, showing Division 1, Division 2, Typical Game, Col2, Col5, Col8, Col11, Col14, Col2; with Final Score Gap (Points) in the x-axis and Median Jam Differential (MJD) in the y-axis.. The x-axis shows values from -1.8546344350480126 to 574.0936592125927. The y-axis shows values from 0 to 293.39526777546376.